A number of my books contain database examples in them—most of which rely on SQL Server. One of the issues I’ve encountered over the years is that a reader will write in to say that the example doesn’t work as written. In most cases, the procedure and the example source code is just fine. In addition, there is nothing wrong with the user’s system, the Visual Studio installation, or the version of SQL Server used. The problem lies in the fact that the SQL Server Browser service isn’t started. Visual Studio relies heavily on this particular service and it isn’t started by default, in most cases, when you install SQL Server or SQL Server Express. Unfortunately, the error message you receive will say nothing at all about SQL Server Browser. In fact, the message will complain about something completely unrelated and it may not even point to the database as the problem. This particular error has caused me (and many others) a lot of lost time. In fact, it’s such a nuisance that I immediately check to ensure the service is actually running before I look for other sources of problems (unless there is another obvious problem source). When you encounter an odd problem, especially an odd problem with source code that has worked in the past, and the application relies on a database, consider checking the SQL Server Browser service to ensure its running. There are commonly two places in which you can look for the SQL Server Browser service. Because the SQL Server tools don’t install with the copy of SQL Server Express that comes with Visual Studio, I’ll discuss the place that everyone can look first, which is the Services console found in the Administrative Tools folder of the Control Panel. Simply open the console up, locate the SQL Server Browser entry, and ensure that it’s running as shown here. Notice that the service is set to start automatically each time the machine is booted. Using this setting usually ensures that the service will be available when needed. However, don’t assume that this setting means the service is always going to be available. If the service encounters a problem during the boot process, there is every chance that it won’t be available when you need it. Always verify that the service is indeed running when you encounter problems. You can start a service by clicking the Start link on the left side of the right pane. The figure shows the Stop, Pause, and Restart options because the services is already started, but the Start option will appear when the service is stopped. If the service isn’t set up to start automatically, right click the service’s entry in the list and choose Properties from the context menu. Set the Startup Type field value to Automatic and click OK to configure the service to start automatically. The second place you can look for this setting (when you have the SQL Server tools installed) is the SQL Server Configuration Manager. 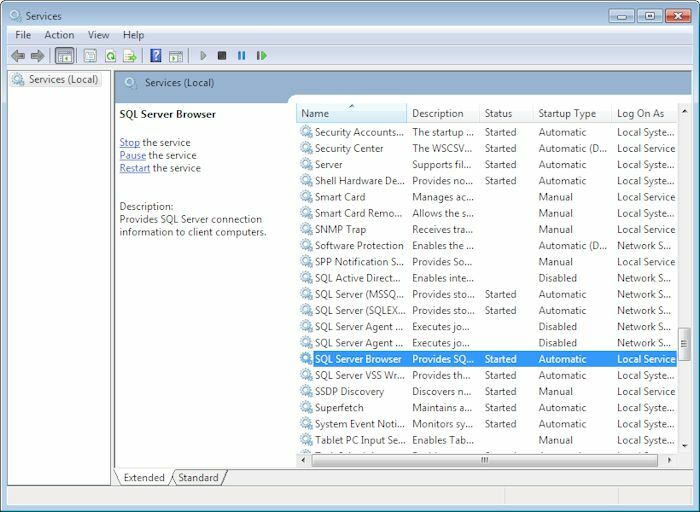 You’ll find the SQL Server Browser entry in the SQL Server Services folder as shown here. Again, make sure the service is actually running and that you have it configured to start automatically. Otherwise, you’ll find that you spend a lot of time chasing ghost problems that don’t actually exist. Of course, I’m always here to help you with any book-related problems you might have. Feel free to contact me about any issues with my books at John@JohnMuellerBooks.com.